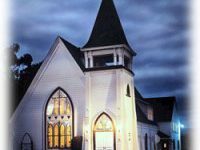 We are members of the oldest mainline Protestant denomination founded on American soil, the Christian Church (Disciples of Christ). Many people have never heard of the Disciples because many of our churches simply go by the name “Christian Church”, a sort of plain label, generic title. But there are about a million Disciples in the United States and Canada, mostly in the Midwest. We Christians (Disciples of Christ) have always followed a theology which challenges people to think for themselves and get involved in loving God by serving others. We have no creeds, no specific interpretations of Scripture that one must adopt. We are simply dedicated to making Jesus of Nazareth known to the world as the Christ of God. We wish to invite the world to the Lord’s table. Our denomination’s logo is a chalice inscribed with St. Andrew’s Cross symbolizing the Communion in our experience of God’s love and the Cross that looms in our walk with Christ. Our lovely “little white Victorian on the corner” has been a significant part of Pacific Grove for a century now. Our Victorian heritage has been preserved in our decor and in our commitment to this community. We have always been a small congregation, with a loving fellowship that includes people of all ages and economic backgrounds. You are welcome here!